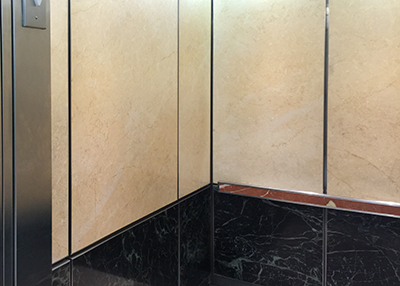 When it comes time to consider your elevator interior, elevate your expectations with stoneply panels. StonePly’s Panels brings you the elegance of natural stone to your elevator interior. StonePly Panels are lightweight, customizable, safe and easy to install. StonePly stone panels with a Aluminium Composite Material Backing weights less than 4 pounds per square foot and panels are only up to one inch thick. StonePly panels are perfect for elevators. Stoneply can be cut into a variety of shapes and sizes. StonePly can also be made into medallions. StonePly’s lightweight reduces the weight load on the elevator. Stoneply conforms to all major building and elevator codes and requirements. Stoneply’s panel are stable and will not warp from humidity and temperature changes. StonePly panels are prefabricated meaning installation can be done quickly and safely with minimal disruption businesses or construction sites. Elevator side panels are mounted on a Honeycomb backing and installed easily with Z-clip brackets. Floor Panels are mounted to an Aluminium Composite Material backing and adhered to the floor of the elevator cab. 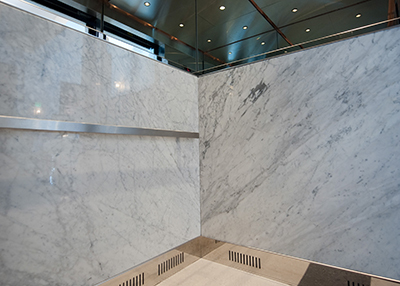 StonePly stone panels can help your elevators rise to the occasion. For more information, visit stoneply.com, email info@stoneply.com or call 903-454 4630.